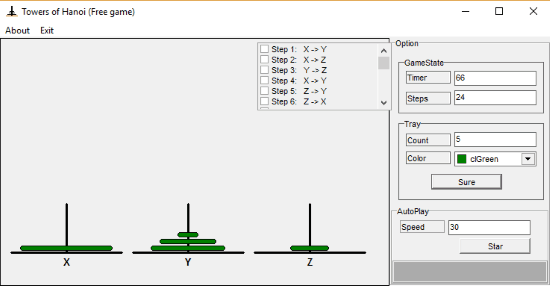 Play Tower of Hanoi mathematical puzzle game with these 3 free software to play Tower of Hanoi game on PC. Tower of Hanoi is a very famous mathematical puzzle game. It consist of 3 rods and numerous disks of different sizes. The game requires you to move the entire stack of disks to another rods without placing larger disks on smaller disks. This way, you are always required to stack disks in ascending order of size. The real catch with this game is that you need to stack the disks in minimum number of moves. Since the game is a mathematical puzzle, it has a mathematical formula for minimum moves. That is, 2n-1, here n is the number of total disks. The list contains different software that allows us to play different versions of Tower of Hanoi game on PC. All the versions of the game listed here are very intuitive and lightweight. 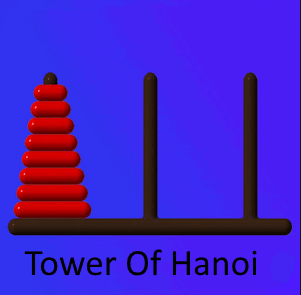 You can also take a look at Tower of Hanoi app for Windows 8 and android. Now, lets take a look at the list of Tower of Hanoi Games. T-Hanoi Tower is a free software to play the famous mathematical puzzle game of Tower of Hanoi on PC. The software allows you to use up to 30 disks to play the game. It even lets you pause the game if needed. You can undo the last few steps, however, undoing is also counted as moves. You can always see the total Elapsed Time in the bottom left side of the interface. The software also helps you keep track of the number of moves as you can see the total numbers of moves you have made next to Moves. There is also a tab for Rules, where you can learn all the rules of playing this game. The game doesn’t show the solution or replay of the game. Once you have downloaded and installed the game, you need to first set the number of disks you want to play with. then you just need to press Play to start the game. You just need to follow the rules to play the game. 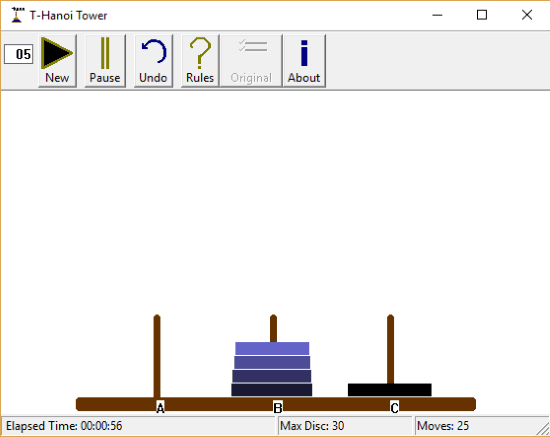 Towers of Hanoi is another software to play this famous game on PC. This mathematical puzzle game is good for mental exercises. This software allows you use up to 15 disks to play this game. You can see all the steps you have taken in a small window. On running the software you will see that all the disks are stacked on the left rod in ascending order. You first need to set the Count and Color of the disks. After that, you can play the game by stacking all the disks in different rod in the same order. You can keep a watch at the time spent and number of moves under GameState. It also allows you to see the replay of the standard solution. You can set the speed of the replay under AutoPlay. 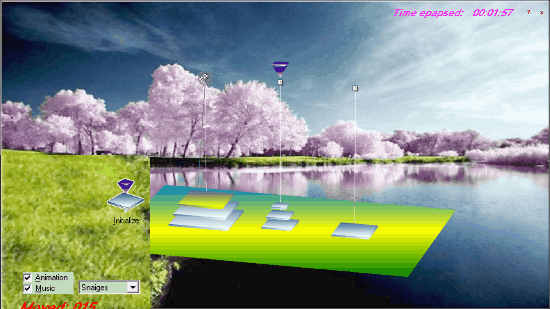 Tower 3D is yet another version of mathematical puzzle game of Tower of Hanoi for PC. This game is a 3D version of the game. Here you can use between 4 to 9 disks to play the game. This game also has an Animation and Music checkbox to have animation and background music. In order to play this 3D version of the game you first need to set the disk count and then you need to click on Start to start playing the game. Here, first you need to click on the disk you want to move and then click on the rod where you want to place it. You simply have to follow one simple rule of not placing larger disk on smaller ones. You also get to see the perfect solution of the game by clicking Solve. Here also, you get to keep tab on the Time Elapsed and Moves on the interface. If you ever want to play Tower of Hanoi game on PC, then these software let you do that with ease. A big advantage of them is that you can play Tower of Hanoi offline, without a need to connect to internet. I really wish they come with option of Hints and solution as well.